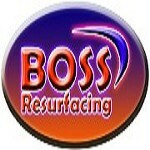 Boss Resurfacing: Boss Resurfacing & Outdoor Living Has A New Profile Image! BOSS Resurfacing has been delivering quality and value to the residential and commercial decorative concrete market since 1998. BOSS Resurfacing is the first company in Texas to offer 1/4'' stamped concrete over all existing surfaces and with millions of square feet installed to date, leads the North Texas decorative concrete industry in quality, service and integrity. Our decorative concrete options include: Stamped Concrete over all existing surfaces, Traditional Stamped Concrete, Acid Stained floors. Epoxy Floors and Polished Concrete. They call us ''The BOSS'' for a reason. BOSS Resurfacing is the original stamped concrete overlay company in Texas and is the manufacturer of Mega-Crete decorative concrete products and we currently maintain one of three training facilities for our product installations right here in Grapevine Texas. Whether your tastes are conservative or ultra contemporary, no other company can offer you more ''Bang for your Buck'' than the BOSS Resurfacing. LikeUs on FaceBook and receive an additional 5% off any of our decorative concrete services. BOSS Resurfacing offers a complete range of Decorative concrete and outdoor living services to our clients. Some of the services offered by BOSS Resurfacing include Stamped Concrete Overlays, Acid Staining, Spray Textures, Broom Finish Overlays, Epoxy Floors, swimming pool renovations, tile, coping, plaster, new swimming pools, outdoor kitchens, arbors, pavilions, fireplaces, etc. BOSS Resurfacing specializes in 1/4'' stamped decorative concrete overlays, concrete acid staining, epoxy floors, and architectural concrete services. BOSS Resurfacing has offices located in Grapevine, Texas and our online presence is at www.BossResurfacing.com. BOSS Resurfacing was founded in November of 1997 by brothers Keith and Danny Kimberlin. Keith has a background in Aerospace Quality Engineering. He worked for a major aerospace company in Grand prairie Texas where he specialized in Integrated Process Management Methodology. He was laid-off from the aerospace company in mid 1994 and was subsequently hired as the Quality Manager and Quality Systems developer for the largest insulated panel manufacturer in the world located in Lewisville Texas. Reporting only to the President and C.E.O. of the company, Keith developed their quality department, testing laboratory and deployed process management techniques to streamline the manufacturing process and quantify defective materials to reduce scrap. Keith was directly responsible for the company winning ICBO recognition faster than any other company in ICBO history. The brothers started BOSS Resurfacing while still employed with each of their companies. When the company was sold to a major firm in Mexico, Keith resigned from the insulated panel company in mid 1999 to officially commit his self, full time, as president of BOSS Resurfacing. Keith and Danny initially worked the business on nights and weekends, they ran BOSS from the back of their rehearsal studios in Irving Texas bearing the same BOSS name.Keith maintained BOSS as the sole owner and operator of the business in 2001. Over the next few years BOSS Resurfacing started to gain momentum in the market place and in order to operate more efficiently had to find a larger facility. In 2002 BOSS Resurfacing moved into a 3,500 sf. facility on Peters road in Irving across from Texas Stadium. In November of 2004, Keith joined forces with investor Bill Becker. Together, Keith and Bill have used common interests and resources to take the business to the next level. The partnership has proven itself successful by nearly tripling the company’s gross revenue over a three year period. Now located in Grapevine Texas, BOSS continues to lead the industry in quality installations and has over 5,600 customers and is growing stronger each year. BOSS Resurfacing can also be found online at www.BossResurfacing.com. Being a true-one-stop-shop for all of your decorative concrete needs... We do it all. We pride ourselves on the fact that BOSS Resurfacing is the manufacturer of Mega-Crete decorative concrete products and trains other contractors on the proper installation of Mega-Crete. We actually wrote the book on Mega-Crete HD (high definition) decorative concrete overlays and Since 1998 we have trained over 100 companies in the art of overlay technologies. BOSS Resurfacing has stamped more than 3.5 million square feet concrete overlays throughout Texas for more than 5,600 customers and counting. We take pride in having a satisfaction rating of more than 99% from such a large number of clients. BOSS Resurfacing is the first company in Texas to offer Ultra-Surface 1/4'' stamped concrete over all existing surfaces and is the creator of Mega-Crete decorative concrete products. With millions of square feet installed to date, BOSS Resurfacing leads the North Texas decorative concrete industry in quality, service and integrity. BOSS has trained over 100 companies in the art of decorative concrete and has developed proprietary installation techniques that deliver the highest quality stamped concrete product on the market to date.